Hi Mom4Real readers! I’m Gina from The Shabby Creek Cottage. My blog is all about finding easy ways to eat, make and decorate to make live a little sweeter. Today I’m going to share a fake-out recipe that looks and tastes amazing, but it’s super easy to make! 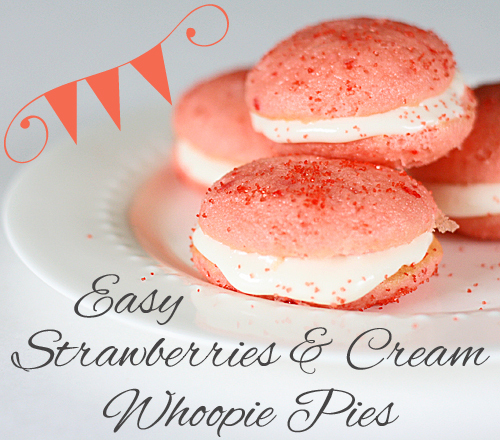 Strawberries & Cream Whoopie Pies – oh doesn’t that sound amazing? 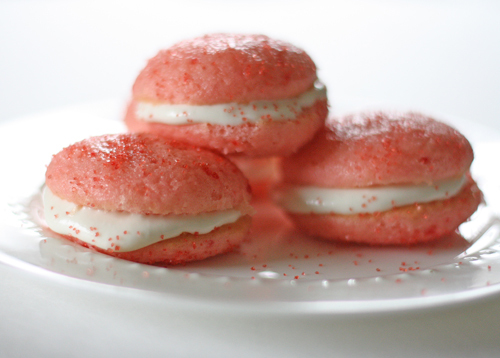 Whoopie pies are seriously easy to make, especially with a fake out method like mine! All it takes a box cake mix, some cream cheese frosting and aluminum cupcake liners to make these easy treats. Prepare the cake mix according to the instructions, making sure to use an electric mixer to whip up the batter for about 2-3 minutes until it becomes thicker than you can get it by hand. Next, take the cupcake liners and put them onto a flat baking sheet. Use your fingers and open up the liners until they have a open bottom and are about 1/2 as tall as the original. With a tablespoon scoop, put a dollop of the cake mix in the middle of the liner and bake for 10-12 minutes until done. 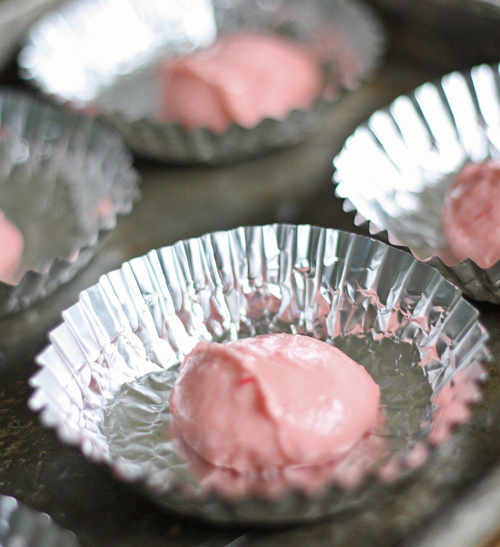 After they come out of the oven, peel them off the wrappers and fill the middles with the cream cheese frosting. And that’s it! They’re so easy and so good! I do suggest not making them on a humid day, because the cake mix seems to get a little sticky. If you wanted to make the cake mix or frosting from scratch, they’d be even better. Thanks to Jessica for letting me hang out here on Mom4Real today! Make sure to stop by Tatertots and Jello to check out the cool Cork Topped Coffee Table I’m sharing there today!